Senna stimulant laxative tea bags, Combined with fennel, orange peel, cinnamon, coriander and ginger for digestive support. Senna leaf is the "move" in this tea, and it works by direct action on the intestine, which is why it is called a stimulant laxative. 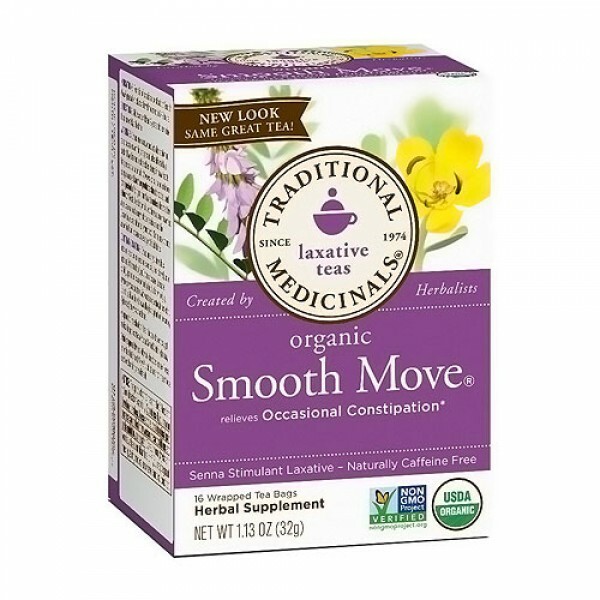 Smooth Move is a sweet tasting herbal laxative tea for use in relieving occasional constipation. This product generally produces bowel movements in six to twelve hours. Combined with fennel, orange peel, cinnamon, coriander and ginger for digestive support. Sweet and slightly bitter taste with citrus-orange and spicy notes. Cover cup and steep 10-15 minutes. These steps directly influence the amount of beneficial components that will end up in your teacup! Gently squeeze the tea bag to release any remaining extract. Drink 1 cup preferably at bedtime, or as directed by a doctor. Children 6-12 years: Drink 1/2 cup preferably at bedtime. Children 2-6 years: Drink 1/4 - 1/2 cup preferably at bedtime. Duration of use: Stimulant laxatives should not be taken for a period longer than 1 week unless directed by a doctor. Do not use if suffering from Ileus, acute intestinal inflammation (e.g. Crohn?s disease, ulcerative colitis), appendicitis, abdominal pain of unknown origin, severe dehydration states with water and electrolyte depletion. Do not use laxative products when abdominal pain, nausea, or vomiting are present unless directed by a doctor. If you have noticed a sudden change in bowel habits that persists over a period of two weeks, consult a doctor before using a laxative. Laxative products should not be used unless directed by a doctor. Rectal bleeding or failure to have a bowel movement after use of a laxative product may indicate a serious condition. Discontinue use and consult your doctor.